The Arizona Center for Innovation will host a March 23-24 event for companies interested in pursuing a share of more than $2.6 billion in high risk federal R&D funding through the Small Business Innovation Research (SBIR) and Small Business Technology Transfer (STTR) programs. 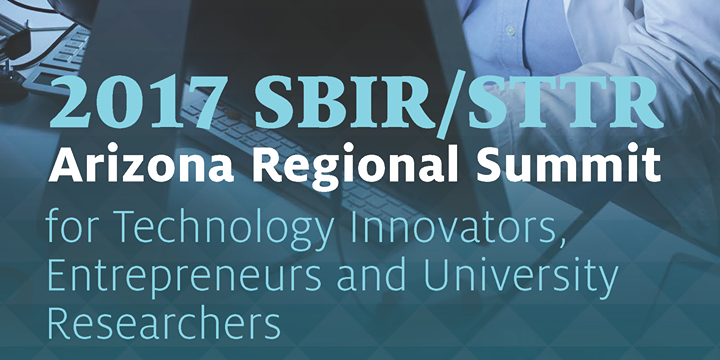 The 2017 SBIR/STTR Arizona Regional Summit for Technology Innovators, Entrepreneurs and University Researchers will be held at the Radisson Suites, 6555 E. Speedway Blvd. in Tucson. Expected to participate are representatives from the U.S. Department of Defense’s Defense Advanced Research Projects Agency, the U.S. Air Force, and NASA. SBIR and STTR help deal with capital barrier access by connecting small firms with key institutions and organizations within state and regional innovation ecosystems. You can learn more about the Summit or purchase tickets here.